Kann der beste Film von Tarantino Fabrik….. It was a lazy Friday afternoon, had dinner outside on Thursday, the day that reminded me I am older by a year. 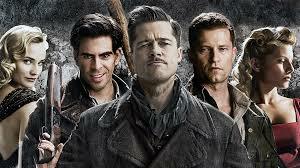 Friday afternoon is when I heard that the movie Inglourious Basterds, one most awaited movie had released. For me, it’s another cryptic presentation from the Tarantino’s factory…Man his movies are complicated for person of average intelligence like me to understand. Hindi movies on the contrary are a cake walk, no need to know history or the director is generally generous enough to take you back in time and add some painful songs which gives the audience a smoke/snack break. But since most of hindi movies hover around Love and sentiment, the audience need not apply their minds to understand the movie. Back to QT, he takes the audience for granted, he expects you to do your home work before you watch his movies. If he is dealing with easier plots then he will juggle around the scenes to complicate things and will expect you to understand the chronology and get the plot. After watching the champion’s trophy semi-finals thru the night, Saturday morning was a late rise. Had to beautify myself so I succumbed to the atrocities showered by a barber’s scissor on my head. By then had booked the tickets for the movie online. Just managed to reach the movie on time else I would need to watch it again cos in QT movies, the first scene plays a very important role and as such the movie is tough, with a missing detail, I would rather choose to walk out of the movie. The film opens in 1941 with colonel landa arriving to interrogate a dairy farmer la padite. Guess a lot of work has gone into the making of the character Landa, he is sweet, cool, smiling but he is brutal and dangerous. The explanation to his transfer to France is because he can think like a Jew and hence he gets the name “The Jew Hunter”. His narration of an anecdote comparing a rat (Jew) and squirrel about possessing the same qualities but a subtle difference in treatment depicts the depth of his hatred to jews. Landa manages to break down LaPadite and locates the hiding place of the Jews underneath the floorboards. Only one out of the family manages to survive (Shosanna) who escapes to paris.